One of the most revered prefixes (Jupiter) in the history of synthesis returns. Paying homage to its legendary namesake with road-proven hardware and massive sound, the JUPITER-80's expressive, organic approach to synthesis makes a new world of sound design possible. 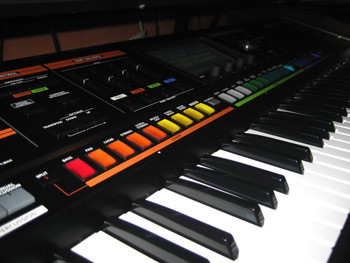 CleverJoe says: it's always a good idea to check out eBay's used Roland Jupiter-80 Synthesizer listings. Putting the Synth back in Synthesizers. Product info, interesting facts, tips on where to buy. The JUPITER-80 nods to its past with lethal, multi-layered synth sounds so fat you'll need a knife to cut through them. Musicians looking for a live performance synth will love the stockpile of "meat and potatoes" sounds onboard, including a full range of Roland's grand pianos, strings, brass, and much more. An easy to use interface and touchscreen, heavyweight design, complete with metal side panels, recalls the legendary JUPITER but with all of today's technology. Full-color touchscreen and creative hands-on controllers. Powerful integrated SuperNATURAL synthesis engines designed for legendary vintage synth sounds to realistic organic acoustic sounds and more. This synth offers a ton of possibilities for stacking, layering, blending and tweaking your sounds using something Roland call 'SuperNATURAL' architecture. A fun little toy is called the Tone Blender, which tweaks values of multiple parameters simultaneously and lets you “Capture” any new combination and save it as a Live Set. Create complex, emotional textures that respond, react, and evolve like nothing you've heard before. Tone Blender can also dramatically enhance your live-performance capabilities by letting you assign its multiple parameters to controllers such as the D-Beam. The filter section is one the most important tool kits for editing SuperNATURAL synth tones. 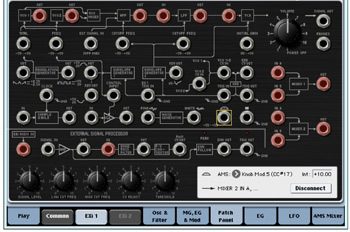 Version 2 adds three types of vintage low-pass filters to the lineup. With the addition of these filters, each with unique cutoff and resonance behaviors, you can faithfully recreate coveted synthesizer sounds of the past. 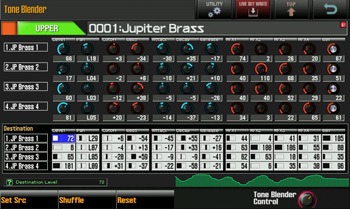 The JP Synth Editor is an iPad app that allows you to edit the SuperNATURAL Synth Tones of the JUPITER-80. Control your synth tone parameters, including the Vintage filter type (a new addition to JUPITER-80 Version 2) with the iPad's touchscreen. Download it free from the Apple App Store. The JUPITER-80's sound engine handles four x tones with dedicated DSP per tone as a basic unit “Live Set” for manual performance. Layering of Upper and Lower Live Sets, plus a specialized “SOLO” part, means the incredibly massive nine-tone-stack sound. Customized complex settings can be saved as Registrations, and easily recalled during live performance. Used Roland Jupiter-80 Synthesizer listings.